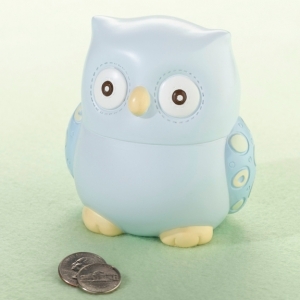 This resin, bright-eyed blue owl coin bank makes an adorable addition to any nursery. The owl is painted in a soft blue and has a coin slot on the back of its head (a rubber cork seals the bottom of the bank). The owl measures 3.75" tall, 3.75" wide (from wing to wing) and 3.25" deep (from beak to tail).